Herbal walk is a very narrow strip against the house with a thriving herb garden. I have sage, four kinds of basil, lavender, three kinds of thyme, garlic chives, lemon balm, parsley, curly and Italian, oregano, summer and winter savoury. I have a pot of chives and tarragon (This is what is left from a 5'x8' patch of tarragon I had to destroy to have a perennial border elsewhere. They won't play nice so the chives and the tarragon have to be separated.). Spring 2000 The pots of chives and tarragon has survived another winter starting to sprout. The herbs are in thewrong spot but they don't know that and grow anyway. Please don't tell them. It is right outside my back door and so convenient. The chimney guys, see below, tried to demolish my herbs, too. I found a glob of cement on top of my chives. The only thing to do was to give them a haircut. They had put buckets that held the cement on top of the herbs and bags of junk as well. A Host of Hostas is a narrow strip opposite the herbs and contains Periwinkle, violets and a river of plain green hostas. Except for the basil and parsley these two borders take care of themselves. Sad story to relate: we had to have our chimney torn down and had to have it replaced. It was cracked from top to bottom and leaking into the bathroom crumbling the ceiling. The chimney guys were, as you could say definitely, not plant friendly. Now about eight feet of my beautiful river of hostas are almost totally squashed. I have cut off the worst of it and probably will dig up and divide off the killed bits and replant. I'm waiting until the roofers have finished their worst. This all started when we thought only the roof needed redoing. The roofers came and went with it all the junk that it entails. None of it was left for me to pick up. They left the place spotless. I can't believe it. My back door terracotta pot garden. 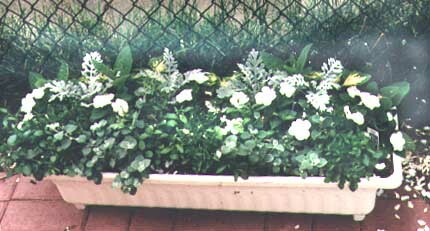 I have mixed pans of annuals that I plant every year. This year I have coleus in various hues, impatiens, pansies and violas. I have two strawberry pots with coleus in them with violas in the pockets. I have woven baskets, I made, filled with pine cones, a tiny garden angel and some pretty bottles. My next door neighbour loves my terracotta planters with the blowsy annuals spilling out. This step was reworked this spring with 6'x6" lumber and recycled bricks that held back the old perennial border. P.S. We have a robin family that build their nest on top of the back door light. Shirley and Ralph (my names for the robins) are of the mind if you won't bother us, we won't bother you. We coexist nicely. Although I don't turn on the backdoor light in fear of cooking the eggs. I have extra clean up duty as their nest tends to have pieces fall out of it onto the step. Birth announcement: Ralph and Shirley have had three chicks. This intrepid duo braved the chimney guys and stayed on the nest and hatched the three chicks. Chicks have grown and, as it were, flown the coop. They look very cute stretching their necks up to be fed. I don't think I can get a picture as it is under the eaves and very dark. Great for the robins but not for picture taking. . I ran across the tags for the violas and pansies I have planted. The violas are Sorbet series 'Yellow Frost', 'Plum Velvet', 'Coconut', 'Lavender Ice'; and 'Princess Mix'. The pansies 'Delta Yellow, Pink & Red Blotch', 'Bingo Deep Purple & Rose Frost', 'Maxim Bronze', 'Fama Clear Face Mix and 'Imperial Silver Blue. I have some of the 'Wizard Mix' coleus among others 'Velvet' and 'Jade'. Here is a list of the named varieties of coleus I have 'Flirtin Skirts', ' Black Dragon', ' Marisa', 'Penny', 'Pat Martin', 'Plum Parfait' and 'Japanese Giant'. I have trailing lobelia 'Regatta Blue' and 'Sapphire'. I have become very fond of coleus. I love the colours and different leaf shapes. I would like a whole section somewhere devoted to coleus. This area has beautiful soft pink peonies, yellow lilies, violets and primroses in various colours. I have tried growing roses and clematis but the area doesn't get enough sun so they either don't bloom or die. We also have a tv antenna (Racoons find this a great help getting up onto the roof. One year we had a mother and four babies residing in our chimney. We have left it though because its a great ladder for us getting on the roof for repairs and cleaning gutters) also an a/c unit so I have to be careful what I plant. Except for the impatiens and coleus I put in - this border takes care of itself. This is the actual site of the chimney guy's scaffold. The peonies were semi covered so they only received bent and broken stems, the flowers had already bloomed. Thank heavens. I had to chop off the broken and bent stems. The whole area had to be hosed down repeatedly as they shoved everything off the roof. It took days to get out most of the brick shards and old mortar. We now have a beautiful new chimney and three really cute rain caps in black. The chimney guys did a great job on the matching the brick. I guess that's what counts and I hope the plants grow back. We can use the dirt we get when we dig the pond to fill the rut the chimney guys made in our front lawn. They made them driving across the front lawn to off load the bricks. Now I'm bracing for when the roofers come. Our next door neighbour has a dog called 'Bandit'. He loves to lie in my neighbours small garden plots she has on either side of the walk, like we have. So it is a losing battle trying to keep plants going. Some hardy perennial have taken root and are nice to look at. So I am planting up a narrow long planter with coleus, 'Golden', nicotiana, 'Domino White', german ivy and feather ferns from my green grocer. It will be a nice cool group of plants to look at from either side and Bandit can't sit on them. I look out at this spot from Pooh's Thoughtful Spot (the gazebo). It is a nice cool colour combination to look at in the heat of summer. Had to add variegated English ivy (Hedera) to complete the picture. It needed a little something hanging over the edge that was green and white. I must take cuttings of these plants for next year. I hope I have more luck with them this year. I usually can get them through until March or April then they just get ratty.